ROB ELLIOT EDGES out Darren Randolph for a spot in the first team, following a stellar performance against Bournemouth at the weekend. With Shay Given yet to make a single league appearance for Stoke, there is no place on the bench for the veteran stopper. As usual, Seamus Coleman is the best-performing Irish defender on 24 points. Just below him is Damien Delaney on 23 points, who would likely be ranked even higher if injury troubles hadn’t significantly disrupted the Corkonian’s season. Ciaran Clark joins Delaney in the centre, while John O’Shea has to settle for a place at left-back. Marc Wilson watches on from the bench. Jon Walters (30 points) and Robbie Brady (at 43 points, the highest-scoring Irish player so far this season) are both regarded as midfielders and consequently feature in a five-man formation alongside Wes Hoolahan, James McCarthy and James McClean. There is no room, however, for Glenn Whelan, Eunan O’Kane or Harry Arter among others. A straightforward choice, given that Shane Long is the only Irish striker currently playing at Premier League level and therefore, the only forward that Fantasy players have an option to select. The Tipperary native has a modest 10 points so far, owing partially to recent injury problems. Team (4-5-1): Elliot; Coleman, Delaney, Clark, O’Shea; Walters, Brady, McCarthy, Hoolahan, McClean; Long. Email “Here's what the Irish team to face Bosnia would be based on Fantasy Football points*”. 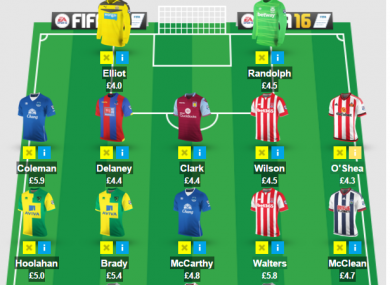 Feedback on “Here's what the Irish team to face Bosnia would be based on Fantasy Football points*”.